Almost 30 years ago, that very same computer model entered our family home. It was a hand me down from my uncle, who was quite interested in computers even back in the early days of home computing, and who had upgraded to a new-back-then Amiga 2000. 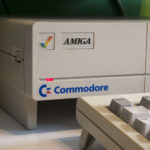 I still remember looking out the lounge room window and seeing my uncle walking up our driveway, holding a large white box with the word ‘AMIGA‘ and the rainbow tick logo on the side — wondering what was inside. Our family never had a computer before. I don’t even think at the time that I had even seen one and recognised what it was, let alone touch or use one. Both my dad and my uncle were in our study, pulling the white plastic slab out of its polystyrene inserts, and plonked it on our large wooden desk. 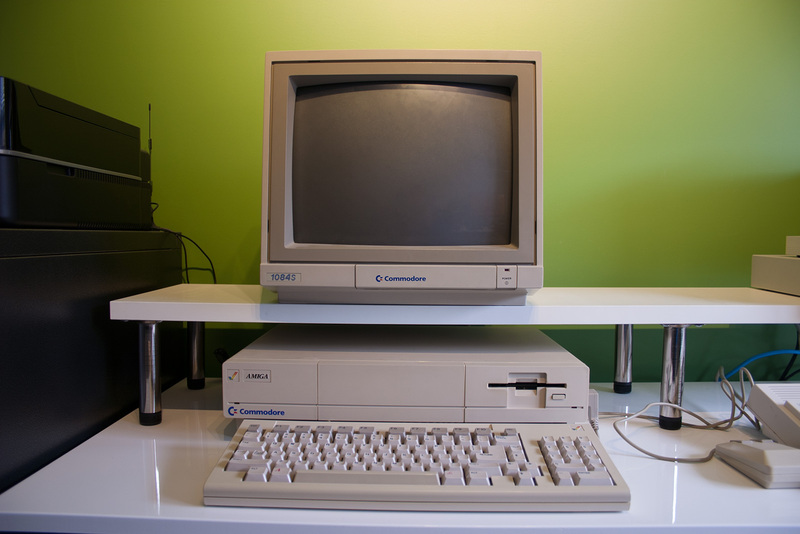 The left side of the white plastic slab had the word “Commodore” in bright blue sans-serif text. The right side of the white plastic slab had an ominous looking slot and button. The keyboard was cramped and complicated, connected to the back of the machine with what looked like a telephone handset cord. The tank-shaped mouse looked out of place, what without its usual mouse mat, as an off-cut of foam wrapped in some scrap fabric was used as a temporary substitute. 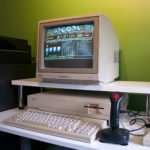 The monitor was missing — an RGB monitor was never included in the sale price of the Amiga from the dealer, and my uncle still needed his for his A2000, so an old green monochromatic Mitsubishi monitor was temporarily plugged in. Only later did my dad buy the now legendary 1084S RGB monitor. 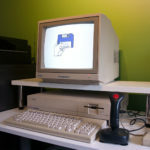 After set up, my dad flicked the power switch on the left side of the computer case, and a graphic appeared on screen — an outline of a hand, holding a square between thumb and forefinger — the Amiga 1000 was asking for the Kickstart disk. A blue square piece of plastic was inserted into the slot on the right side of the slab, with a satisfying clunk. That Kickstart image on the screen sparked something in my mind. This, for me, was Genesis. My world, from that moment on, was changed forever. 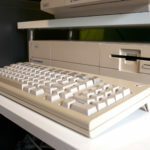 The Amiga had advanced technology, built right in to its contemporary 80s styled computer case, that developers harnessed in the amazing software that they produced over the 9 years it was around on market. Intuitive GUI? Check. Pre-emptive multitasking? Check. 4 channel stereo sound? Check. Palette of 4096 colours? Check. Back in the day where the Amiga’s competition was the IBM PC with its PC Speaker sound and EGA graphics, or the Macintosh with its 9 inch black and white screen (but impressive user interface), the Amiga was a real contender in the home computer market, where practically every electronics manufacturer were throwing their hat in the ring to get a lucrative slice of that pie. But for me, an eight year old boy, all I cared about were the games. Shifting gears and overtaking traffic in Test Drive. Shooting helicopters and missiles in Silkworm. Fighting karateka and thugs in Ninja Mission. Raiding castles and saving the princess in Defender of the Crown. Collecting flags and jumping logs in Buggy Boy. 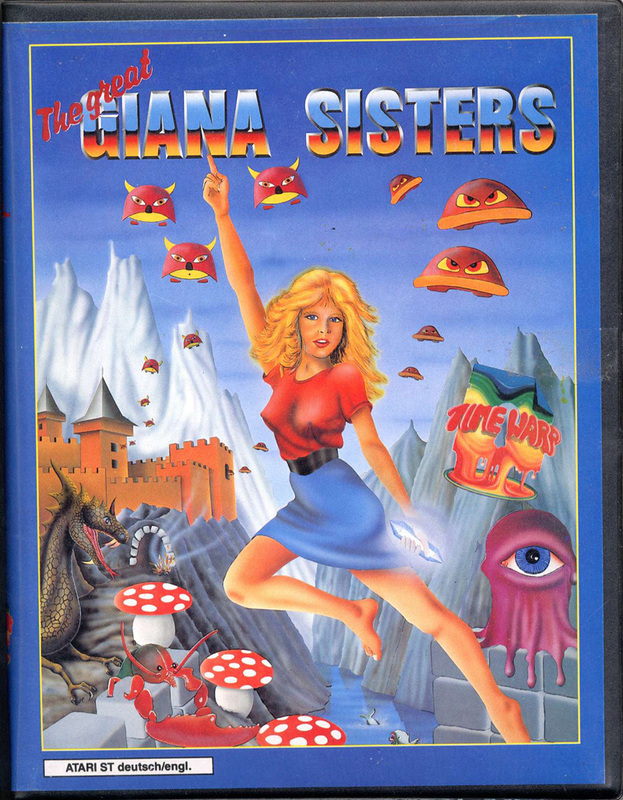 Turning a slight shade of red whenever the girl wearing the sheer shirt in the Great Giana Sisters intro screen appeared. Finding the Joker and using the grappling hook in Batman: The Movie. Speeding down the highway and just crossing the checkpoint in Lotus II. Collecting fuel crystals and solving maths problems in Discovery, which showcased the Amiga’s capability of voice synthesis. Rolling around and avoiding traps in Marble Madness — the first game I loaded up the day we got the Amiga 1000. My most favourite game of all, a game I still play on my A1200, is Advanced Tactical Fighter II, or ATF-II for short, published by Digital Integration. You play as a fighter pilot, trying to destroy enemy planes, tanks, ships, submarines, bases and other installations, over a tessellating vector-esque landscape. It didn’t have the best sound or the best graphics, but I loved the gameplay. I was a dirty pirate back when I was a kid, so there were no manuals to read up on special moves or techniques in games — it was pure trial and error. ATF-II was a classic example — one of the most effective manoeuvres was the barrel roll, and I had no idea how to do this until very recently, when I finally picked up an original copy of the game from eBay, manual included. That’s 24 years of ignorance staring at me in the face! 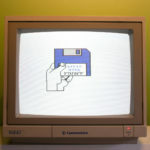 As I grew older, I discovered the Amiga wasn’t all about games. I typed my first homework essay using KindWords, and printed it on an Epson 9 pin dot matrix printer (that my dad struggled to configure — I also learnt a couple of new four-letter words that day). I learnt to type using Keyboard Cadet. I created ‘snowflake’ IFF files using the mirror tool in Deluxe Paint III, and then hit the tab key to colour-cycle. I dabbled in frame by frame animation using Aegis Animator, and then writing out my animation to VHS tape. I tinkered with coverdisks from the big Amiga magazine franchises from the UK, namely Amiga Format and CU Amiga Magazine. 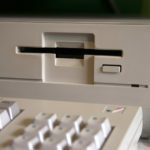 I looked up BBS phone numbers at the back of Commodore and Amiga Review magazine and Computer Trader newspapers, and attempted to connect to my first BBS using a 2400bps modem — and got an angry call back once from some fellow that must’ve had caller ID, because I mistyped a digit in NComm’s dial window. Unfortunately as time wore on after the Commodore bust in 1994, I outgrew the Amiga. Just before this time, my dad had upgraded to his own A2000 that he bought from Myer — it was heavily discounted — which was a more capable machine (hard drive! 1MB of memory!) and I was using Wordsworth to type up essays and papers for my studies, but eventually we realised that it just wasn’t capable enough anymore and we had to reluctantly switch over to PCs and the dreaded Microsoft Windows soon afterward. PCs were surprisingly great for my studies as I became completely PC-compatible, what with my (pirated) copy of MS Word and Excel, and bringing floppies to school with my documents and could successfully load everything up on the school’s Pentium 90s and Windows 95. As time wore on, I kept burrowing myself into the PC computer hardware world, continually upgrading CPU after CPU, motherboard after motherboard, video card after video card, and eventually ended up with a somewhat capable PC made out of a hodge-podge of generic computer hardware parts by the time I left university. But gaming just wasn’t the same as it was with the A1000. Starting work after university meant that I was getting a decent paycheck, and I looked at switching over to OS X, which I did with my first PowerBook G4 within 6 months of working as a PHP developer at a telecommunications company. Switching to OS X was a breath of fresh air, and all the intuitiveness, power and multitasking capabilities that I had lost with the Amiga to PC transition came flooding back to me. 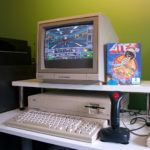 I was missing out on the gaming aspect though, and I couldn’t get back into the mainstream gaming scene that had built up so many years after the Amiga’s demise. 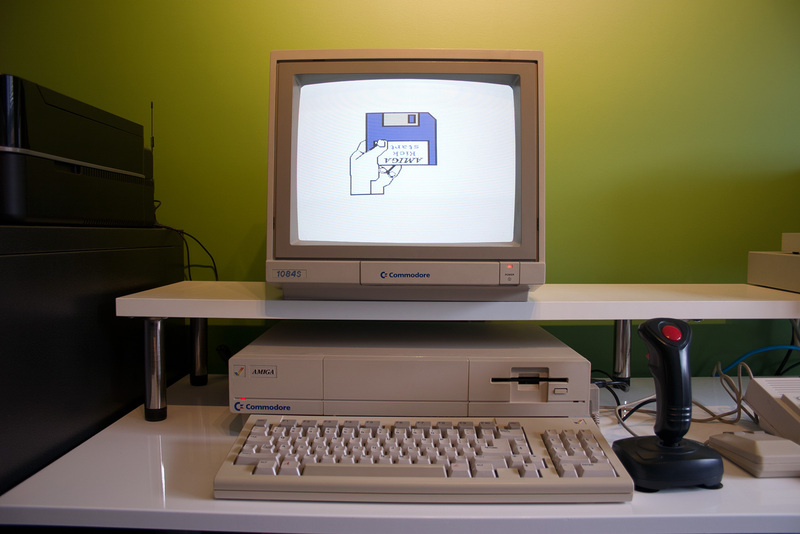 So one day a few years ago I bit the bullet, took in my uncle’s hand-me-down Amiga A1200 that he had lying about in his garage, booted it up, whacked some floppies into the drive on the side, and it’s been bliss since. 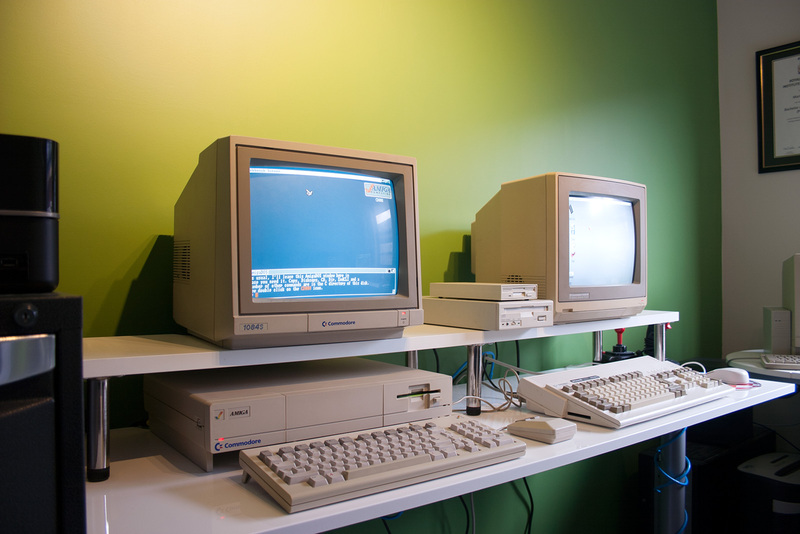 The pictures you see above are of my dad’s Amiga 1000, the very machine I talk about here. While slightly yellowed, it’s in excellent condition, and comes with the original box and original foam inserts. Although not in use anymore and stored in the attic, it’s well loved and you’d have to pry it out of my dad’s cold, dead hands. For this blog post I could’ve pulled off the cover of the A1000 to show you the signatures pressed in the case, or pull out the mainboard for some cool macro shots, but my dad has always stressed that he’s never opened the cover of his beloved A1000, and so I respect his wishes. This is an unmolested, almost untouched, A1000. The day I took these photos, I had a blast reliving all my memories. But at the end of that day, I turned off that little power switch on the side for what could very well be the last time for me, unplugged everything, put that A1000 back in its original box and placed it in the corner of the room where it waits to be delivered back to its owner. The A1000 has a special place in my heart. All Amigas do actually, in one way or another. But the A1000 is what started it all for me. Thanks for the kind words there Mat. My dad’s technical knowledge wasn’t up to scratch for many things with the Amiga either (must’ve been a language barrier thing), but I tried to help him out any way I could. Not that I understood much myself — floppy disk issues or checksum errors were things that 8 year old me couldn’t even start to understand. I can’t finish without saying how awesome your own Amiga collection is. I’ve subscribed to your YouTube and am always in awe with the rare hardware that you’ve accumulated over the years. You definitely look after your precious Amigas very well.